Up until now, all has been quite humble. A donkey-ride to a dusty town south of Jerusalem. Hotel rooms all booked up. Giving birth in a stable and laying the baby in an animal’s feed trough instead of a cozy cradle. Ever since the days of Balaam, God has shown us that pagans can be mysteriously drawn to him and used by him, at times even through their own imperfect traditions of wisdom. If you go to the Sistine Chapel and study Michelangelo’s work, you can see evidence of this. Lining the top of one wall of the chapel are famous paintings of many of the Old Testament prophets. Opposite them are not New Testament apostles as one may expect. But rather, a row of the Sybils, the prophetesses of the ancient world, in whose oracles there were discovered shadowy allusions to a future savior-king. One of Michelangelo’s Sibyls has her mouth agape with astonishment, her eyes fixed on the fresco of the risen Christ at the back of the chapel. Indeed, the deepest desires of all peoples, the elements of truth found in all their religions and philosophies, are fulfilled in Christ. 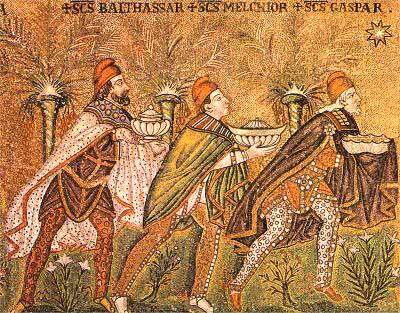 I always thought the 3 Magi were personifications of celestial objects like all the other Biblical Characters were. The 3 Magi were personifications of the 3 stars in Orion’s belt (as well as astrologers themselves) and the Shepard’s represented the Ram and the ending of the age of Aries and Jesus was the sun (son) and represented the beginning of the age of Pieces and the angels were personifications of the angles of the planets to the astrological sign called the aspect. Jesus was said to have been born in a manger because mangers were often caves and ancient people envisioned the sun coming out of a cave every morning after it’s overnight trip through the underworld. The entire scene was an allegory for the transition from the age of Aries (the ram) to the age of Pisces (the fish). It isn’t an actual true story. It’s an astrological allegory.